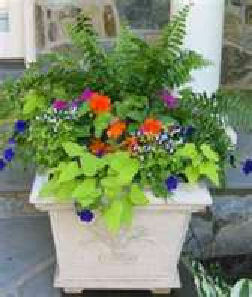 Container garden pots and urns come in all kinds of sizes, materials and styles. They are great for grouping together. Raise them to varying degrees of height by using pillars, blocks, bricks or stands. Grouping containers can be effective – for display and practicality. A grouping of three or five pots can create a nice corner. Line them up and they act as a barrier or wall. One well placed container can be effective too. Grouping pots makes a nice presentation. Use pots that have at least one common characterisitc – shape, color, material, etc. Grouping single-plant containers together allows you to combine plants that don’t share the same requirements for moisture, pH and fertilizer. 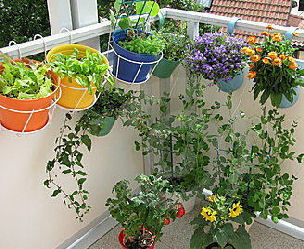 It aids in watering, shelters plants from the wind and helps reduce evaporation. 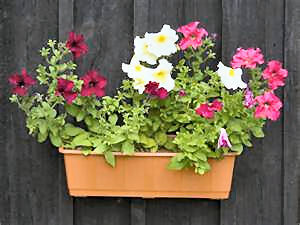 Container garden pots can be hung, just like baskets or boxes. Inexpensive hooks like the ones on the left bring the pots up to a level where they can be seen better and are more accessible for care. This is especially important in small areas, like balconies, where floor space is at a minimum. 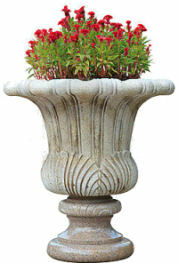 Half-pots and urns can also be purchased that have one flat side. These are also nice for areas where it’s better to use some wall space rather than use up the floor space. Hang these flat-sided container garden pots on long expanses of blank fencing or walls to break up that space and add color and interest. Because they are generally small, these planters will need frequent watering but they can create lovely displays especially when hung in groups. This curvy urn accents the shape of this combination. A beautiful, curvy urn makes a display like this that much more effective. 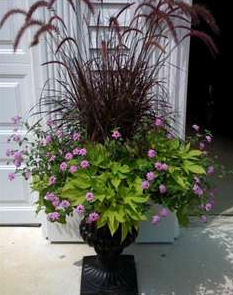 The curves of the container along with arching grasses reinforce this dramatic look. These same plants would not have nearly as much impact if they were planted in a plain round pot. 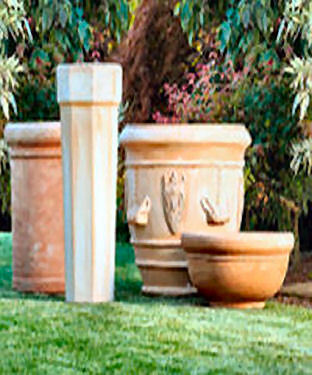 If you can’t afford a large urn, stack several concrete blocks and set a large pot on top. Make sure the ground under the blocks is level for stability. 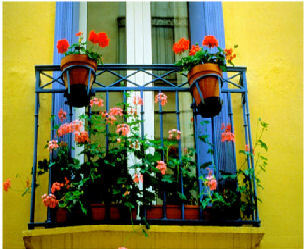 Hide the blocks by placing other potted plants in front of them or use vining or trailing plants to camouflage them. Terracotta containers come in a variety of shapes and sizes depending on your needs and tastes. It is very affordable. However, it is fragile and will chip or break easily. 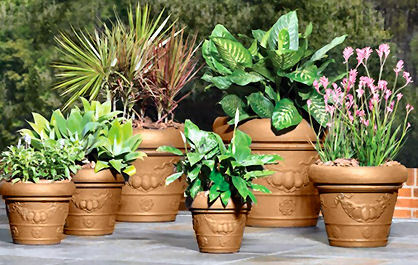 It is a porous material that absorbs water so containers planted in terra cotta will require more watering. If you live in area where temperatures go below freezing in the winter, you will need to store your clay pots inside so that they won’t crack. 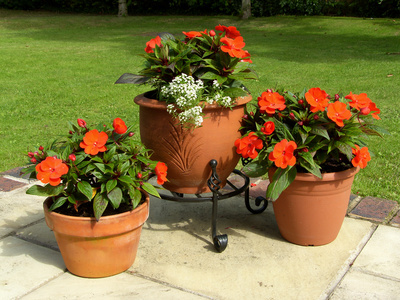 Terracotta pots are great, but they are porous and absorb water – you may need to water more often. Affordable and durable, with the look of clay. They are less porous than clay and are good for big, heavy plantings. Affordable and more durable than clay. Store inside during freezing temperatures. They can be heavy, place the container before planting or put on rollers if you plan to move it. Fiberglas is lightweight and durable. All kinds of colors, sizes and shapes. Lightweight. Plastic will heat up quicker than natural materials so plastic pots will dry up sooner and may need more frequent watering. Plastic container garden pots can overheat roots in direct sun. 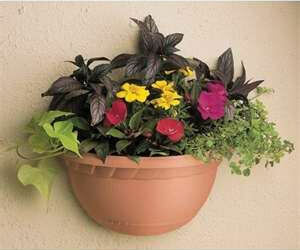 Place the pot in a second container, called double potting. It will be shielded from sunlight. Double potting is also good when you have a decorate pot with no holes. Put a little gravel in its bottom, set in the planted pot and then tip the excess water out frequently. It is wind resistant and a good insulator. It is porous so unless you seal it, you may have to water often. If you live in windy areas, concrete is a good choice. 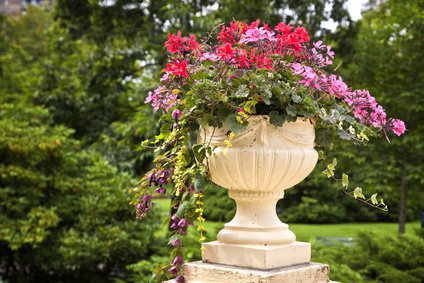 Cast iron planters are beautiful and built to last forever. Once you place them, you don’t want to have to move them. If you want to use made of cast-iron that doesn’t have a drainage hole, use it as a cache pot. Plant in a plastic container will fit inside. Layer the bottom the cast iron container with gravel and set the lighter pot on top of it. Metal containers, especially wrought iron, can be expensive, but they are so pretty in terms of charm and that antique look. Watch for these at auctions, flea markets or estate sales. They will last forever.